According to a 2017 study titled “Text Neck” published in the Spine Journal, spine surgeons have noted a significant rise in the number of patients complaining of neck and upper back pain. Many of these complaints come from children and young people who experience frequent neck pain, shoulder pain, and headaches. Hundreds and thousands of hours spent looking down at electronic devices creates abnormal neck curve alignment and disc herniations. 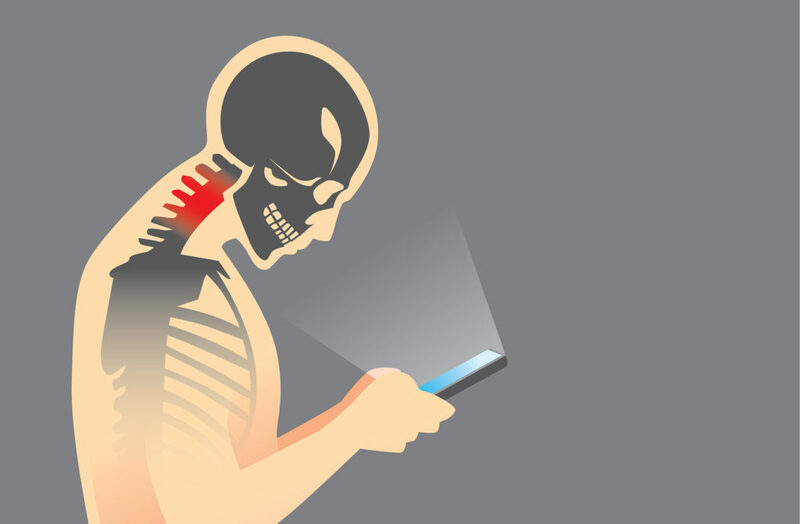 Text Neck bone and muscles have pain because smartphone addiction and long time play. A study of over 7000 young adults between the ages of 20 an-d 24 showed persistent neck and upper back pain associated with time spent text messaging. Accelerated neck and mid-back spinal degeneration becomes a likely side effect of forward head flexion often experienced through texting. The increase in disc pressure during flexion contributes to disc degeneration and poor spinal health. 4) 20 second stretch – Pull your arms and shoulders back while tilting your head up to look up at the ceiling or sky.